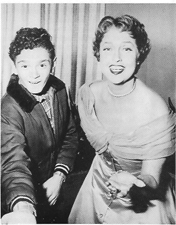 Al Caiazza was the child actor/singer who co-starred with Jeanette in Prima Donna. He was interviewed over the phone and then spoke at a Mac/Eddy Los Angeles luncheon. This excerpt is from Issue #46, in which the entire interview was published. The photo below shows Al and Jeanette in 1958. Article and photo copyright ©1993, 2006, all rights reserved. Sharon Rich: How did Prima Donna come about for you? Al Caiazza: It was 1958. I had done a couple of other films, Good Morning, Miss Dove with Jennifer Jones and Robert Stack, and then I was in The Private War of Major Benson with Charlton Heston. I was real briefly in The Man With the Grey Flannel Suit with Gregory Peck. And then I did some singing on the side. That what I really did was sing. When I was very young my father took me around singing everywhere. SR: That’s a great story. How old were you? AC: Thirteen. I was thrilled. My father was jumping up and down. It was a two-week filming for that half hour movie. The producer was her husband, Gene Raymond. We were invited to her house, and that was a big thrill. She had a beautiful home and she loved roses. She had a big, big rose garden. Must have been a quarter of an acre of land just going down with nothing but different kinds of roses. And I remember her big kidney-shaped swimming pool. AC: Yes, there sure was. A lot of them. Plenty of them. And in her house, I’ll never forget. A servant came to the door and said, ‘Yes? May I say who’s calling?” My father said, “Al Caiazza and family.” “Come right in.” And there was a big picture of Nelson Eddy, a huge picture, in his mounted police uniform, right inside the door. As you go in, it was like a little hallway. And right on the wall to the right was a HUGE picture of Nelson Eddy. SR: When you say huge, how many inches do you mean?